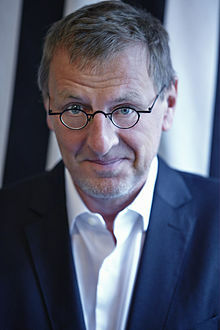 Grégoire Delacourt (born 26 July 1960 in Valenciennes) is a French advertiser and writer. In his youth, Delacourt was an intern at the Jesuit College "La Providence" in Amiens (the same college that current French president Emmanuel Macron attended 17 years later). He obtained his baccalauréat in Lille and then began law studies in Grenoble, which he quickly put an end to. He became a publicist in 1982 and in 2004, created with his wife Dana Philp his own advertising agency, Quelle Belle Journée ("What a beautiful day") with which he signed contracts with brands such as Sephora, GO Sport, Caudalie, Folio (Éditions Gallimard), Taittinger, Crozatier, Directours, Unilever... It was following his dismissal from his previous company that he decided to found his own agency. He published his first novel at the age of fifty, "L'Écrivain de la famille", (more than 20,000 copies sold in large format, 100,000 in pocket-sized edition) then La Liste de mes envies in 2012 which quickly became a bestseller with more than 500,000 copies sold before its release in the Livre de Poche edition where it exceeded 600,000 copies. La Liste de mes envies was adapted to the theater by Mikaël Chirinian [fr], directed by Anne Bouvier and produced by Salomé Lelouch [fr], played from January to May 2013 at Ciné 13 Théâtre [fr]. It was later revived at the Festival d'Avignon at the Off and again at Ciné 13 Théâtre from September 2014 until 12 January 2015. This adaptation won Mikaël Chirinian a nomination to the 2014 Molière Award in the Seul en scène ("alone on stage") category. The cinematographic adaptation, produced by Clémentine Dabadie and Thomas Viguier, was entrusted to Didier Le Pêcheur [fr] with Mathilde Seigner, Marc Lavoine and Patrick Chesnais in the leading roles. The film was released in May 2014 and totaled more than 440,000 entries. In October 2016, a new theatrical version was created in Montreal, adaptation by Maryse Warda, direction by Marie-Thérèse Fortin, with Marie-Chantal Perron in the role of Jocelyne. In January 2017, a third theatrical version was created in Brussels at the Théâtre de la Samaritaine, adapted and interpreted by Lorette Goosse and directed by Christian Dalimier. His third novel, La Première chose qu'on regarde, was released in April 2013. The actress Scarlett Johansson sued, claiming the book was defamatory and exploited her name and image. The judge found the book to be defamatory and awarded the actress 2500 euros, while rejecting the remaining claims. The book sold more than 150,000 copies. Les Quatre saisons de l'été  were published on 29 April 2015 and stage, in the same summer at Touquet Paris-Plage, the summer loves of four couples, fifteen, thirty-five, fifty-five and sixty-fifteen. In Germany, the book ranked in the Top 10 list of Der Spiegel's bestsellers. His sixth novel, Danser au bord de l'abîme  was published on 2 January 2017. - Prix Marcel Pagnol 2011. - Prix Rive Gauche à Paris 2011. - Prix Carrefour du Premier Roman 2011. - Prix Cœur de France 2011. - Prix du premier roman Méo Camuzet 2011. La Liste de mes envies, Paris, Éditions JC Lattès, series "Littérature française", 2012, 186 p. ISBN 978-2-7096-3818-0. - Prix Méditerranée des Lycéens 2013. - Prix des Lycéens 2013 de la Ville de Gujan-Mestras. - Prix Goncourt des Fougères 2014. - Meilleur roman de l'année 2014. ^ "Grégoire Delacourt : Présentation". www.franceinter.fr. 2012. Retrieved 28 June 2017. ^ a b c Vasseur, Pierre (2013). "De la pub au best-seller". Le Parisien (in French) (21313). p. 44. ^ "Molière 2014. Les nominations". ^ "La liste de mes envies - Théâtre du Rideau Vert" (in French). Retrieved 28 June 2017. ^ "La liste de mes envies avec Marie-Chantal Perron". Juste pour rire. Retrieved 28 June 2017. ^ "Scarlett Johansson n'a pas gagné". ^ "Scarlett Johansson fait condamner l'écrivain Grégoire Delacourt". RTL.fr. 2014. Retrieved 28 June 2017. ^ Kellogg, Carolyn (7 July 2014). "Scarlett Johansson wins case against bestselling French novelist". LA Times. Retrieved 7 December 2017. ^ "Académie Goncourt" (in French). Retrieved 28 June 2017. ^ "Prix des Libraires 2015" (in French). Retrieved 28 June 2017. ^ "On ne voyait que le bonheur, juste derrière Charlotte" (in French). Retrieved 28 June 2017. ^ "Les quatre Saisons de l'été" (in French). Retrieved 28 June 2017. ^ Aissaoui, Mohammed (2017-02-01). "Danser au bord de l'abîme: autopsie d'un coup de foudre". Le Figaro (in French). ISSN 0182-5852. Retrieved 28 June 2017. ^ ""La Liste de mes envies", Prix méditerranée des lycéens". ^ ""la Liste de mes envies", lauréat 2013". ^ "Le Goncourt des Fougères à Grégoire Delacourt" (in French). Retrieved 28 June 2017. ^ "On ne voyait que le bonheur, meilleur roman 2014" (in French). Retrieved 28 June 2017. This page was last edited on 5 September 2018, at 21:48 (UTC).